How to add User Access Control for your Digital Publication? After I publish the digital publication, I don't want my book to be read by everyone except those who have access right. How can I add user access control for my publication? With the help of A-PDF Flipbook Maker, you can easily add access right to protect your publication from unauthorized access. Anyone who wants to open your publication will be required to input the password set by you. And below I will show you how to add user access control for your publication. 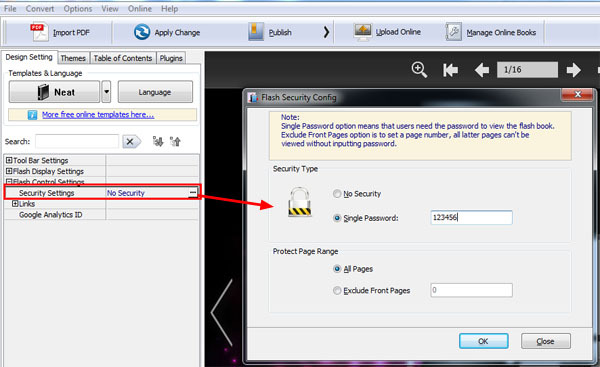 In the Design window, click "Design Setting" tab, and in Flash Control Settings, you will find "Security Settings" option, click the square button and you will see the below dialog. Now you can set a single password for the publication and choose what pages to protect. After you import a PDF and finish designing the book, click the "Publish" button to open the Output dialog. You can output the flipbook in ZIP or EXE format, and click to enable "Need password to open publication…" or click "Advanced" to open Access Control dialog. Input your password and publish the book. 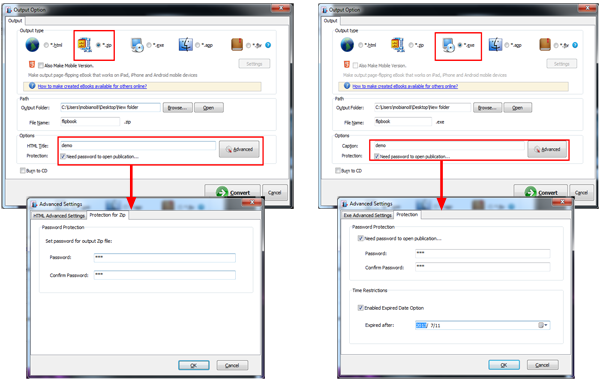 Depress the ZIP file and upload the protected publication online to your server. Click "Upload Online" and upload the publication to our Cloud Hosting. And once you upload the publication to our Online Service, you can decide who have the right to access your online publication.